Today in the Wall Street Journal, Goldman Sachs calls for more regulation and says everyone should support IEX, the new exchange started by Brad Katsuyama and featured in Flash Boys by Michael Lewis. "While we think that a regulatory response may be needed to address these market structure issues, it would be best for the overall market if IEX achieved critical mass, even if that results in reduced volumes in our US dark pool, Sigma X." It took forever, but it finally happend. Back in 2010 I wrote this post saying that more regulation would not happen on Wall Street until the Wall Street guys decided it would be good for them. At the time I thought that they would want it because individual investors would be leaving the market. Any maybe that is why they are calling for it now. Another potential motivation comes out in Flash Boys however. Goldman Sachs is way behind the other high frequency traders. This could be because they cannot get or keep good programming tallent -- because they got the FBI to jail one former employee. They also show their neaderthal tendencies when they refuse to participate in the open source community and proclaim all open source code to be proprietary to them. So they were losing to the other scammers -- what a perfect time to call for more regulation. It was a relatively short time ago that computers were produced in the dozens, cost millions of dollars, and were run by the phone company, the government, and a few very big businesses. The most technological thing that a small business had was a cash register. In an office environment like a law firm or an accounting firm, there were typists, and a copy machine, and the only cloud application was the connection to AT&Ts big computer (the phone). 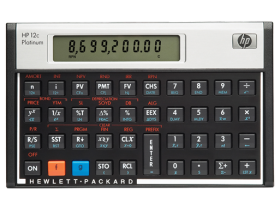 In some cases professionals had specialized tools -- I for example had my HP12C programmable calculator. I never programmed it to do anything though. Amazingly, HP still sells that very calculator - 30 years later. Then came the PC and voicemail and email and mobile phones and well, we all became computer operators plus whatever our jobs had been before that. Now we spend so much time staring at the screen that we feel like computer operators all of the time -- so it is no wonder that we sometimes forget that we have actual jobs to do. Facebook even relieves us from having to pull away from the computer to waste time at the water cooler. We have become much more productive despite the time we have to spend getting our machines to work for us. 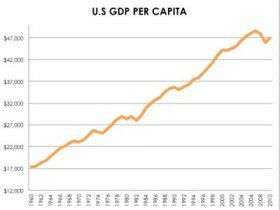 Since the introduction of the PC, GDP per capita in the US has grown from $27,000 to $47,000 per year. And that is the average for the entire country. Keep in mind that workers that use PCs have done much better than the rest of the population, so the productivity has more than doubled for PC users. Advances in technology drive our economy and our ever improving quality of life. This is an easy argument to make when you consider that penecilin was an advancement in technology. A bit harder in the context of nuclear weapons. These advances in technology have provided for us so much extra time and money that we don't know what to do with it all. Most of us have more than one computer plus a phone with computer like computing power plus maybe a tablet too. There are two types of advances in technology: incremental things and game changers. New computing capacity that reduces the time to run a report from a giant database is incremental. New sensors that report every person's location, everything they purchase, and many of the things that they think and say into a giant database is a game changer. The incremental things we get from technology are gains in efficiency that make one business more productive than another. Game changers are new capabilities that just could not be done before and that completely change the business environment. As the cost of compute cycles comes down the incremental functions will blend into the background and deliver less and less profit to their makers -- so look out HP and Dell. Game changers will become the whole game and command more and more of the profits. And as always the pace of change will be accelerating. Very few companies have the will to change their own game. Apple did it with the iPhone and now generates half of their revenues from a product they introduced only 5 years ago. Google did it to the advertising industry -- but it remains to be seen if they can do it to themselves. Microsoft is in the process of trying to change their game with Windows 8. Will they be able to do it? In the period of 2009 to 2013 the Washington State Employment Security Department will have increased our unemployment insurance rate from 3.7% to over 7%. 'Here is our tax rate history displayed on the top of our last statement. Those of you that have fought this battle know that these insurance rates should reflect our experience rating. This essentially means that companies that have more people on unemployment pay higher rates. There are many problems with this system, but here are the two that I think are the biggest. Insurance should spread risk over the pool. The idea that the State of Washington should make money on each unemployment insurance premium -- is counter to the idea of insurance. The government regulates the insurance industry to protect consumers from insurance companies that want to make a profit on every policy holder. The government should apply that measure to itself. The structure of the system raises costs to businesses during an economic recovery. We do not have access to the data that drives our experience rating. In fact, we believe that our experience rating has improved at the same time that our rates have doubled. The more corrosive thing is that if the current system was properly implemented, it would dampen every recovery by increasing tax rates that apply directly to hiring -- right when the economy needs employers to hire the most badly -- during a recovery. We now have to pay over $2,000 per employee per year to have employees in Washington State. And that money does not go to employees -- it goes to the Employment Security Department. Some communities in our state depend very heavily on state assistance to exist and a good deal of that assistance is delivered by the Employment Security Department. Those communities need jobs. Unfortunately, the more a community depends on government assistance, the less that community will be able to attract new employers. The simple reason is that no employer can compete with unemployment benefits that exceed its ability to pay wages. We have closed facilities in small Washington communities for this very reason. No rational person would choose to work for a living if the state will pay them more to not work. I am sure I don't have to carry this scenario out to the extreme to make the sustainability point. Every time we hire for new positions, we advertise in all of our locations and hire the best people we can find. This dramatic increase in the cost of operating in the State of Washington is going to push us to hire more in other locations. The net result will be that the cost of unemployment insurance will have to be borne by fewer and fewer employees. One must wonder where the tipping point is - 10%? I hope someone starts working to turn this around. Atlas Shrugged was one of my favorite books in high school and it was fun to think about those days this week as I watched both Part 1 (on Netflix) and Part 2 in the theater. No matter your politics, these are good movies worth watching. The writing and the acting and the production value are all good enough -- and the content is interesting to think about given the choice we have approaching on November 6th. I find these movies even more interesting because I am just now in the middle of Ken Follett's newest book Winter of the World -- about the rise of Nazi Germany and WWII. Patriotism and its extreme cousin nationalism have been used to implement policies that have not just destroyed wealth and prosperity, but millions of souls. Even though I do not subscribe to Ayn Rand's philosophy entirely, I do believe that a capable person cannot be compelled to carry the people that are not capable of carrying themselves. I do believe that at times people with means will choose to help others. But there is a very wide gulf between choosing to help and being forced to help. I think this even applies to taxes. It is much easier to pay taxes when the money is being put to good use. When it is not, everyone puts the maximum effort into avoiding the payment of taxes. Another of my favorite themes is that absolute power corrupts absolutely. This is plain in the movie as the role of the socialist government expands and the aptly named Wesley Mouch rises to take over everything. Quite similar to stories of unbridled power of the secret police in many other stories. I also thought it was interesting to compare to the way conservatives often make the same mistake. There was a good story in today's NY Times about the potential self destruction of the 1%. Even though these seem like opposites - the arc of each story is really the same. David Segal should look for a job at the Huffington Post. He is a good writer, and he knows some good link bait when he sees it. Today he landed above the fold on the front page of the Sunday New York Times with a non news piece about the wages Apple pays its retail employees. It implies that entry level employee pay should somehow related to corporate profits. Neither is true and proposing that Apple should pay its retail employees differently for any reason other than to compete effectively in the marketplace is preposterous. As an exercise, let's imagine that the Apple board calls an emergency meeting to respond to this article. A great deal has been written lately about how boards represent the interests of the shareholders, but for the sake of this hypothetical meeting, let's just pretend that the Apple board is higher quality than most boards and feels a responsibility to both the Apple shareholders and the Apple employees. Establish a metric that either increases employee pay or decreases CEO pay so that the two are closely correlated and don't get too far apart. Establish a profit sharing plan that distributes corporate profits to employees. Increase front line employee pay preemtively in an attempt to address employee dissatisfaction promted by Mr. Segal's reporting. Decrease front line employee pay because the article ends saying that Apple has more applicants than it needs -- which indicates it pays too much. Do nothing. There does not seem to be a shortage of willing employees, and the quality of employees is more than adequate to do the job. One economic fact that is not reported in the article, but warrants a mention here is that any change that increases the pay of the current employees will provide only a small and very temporary benefit to current employees. The increased pay will attract more experienced, higher quality employees, that over time will displace the current employees. Clearly the Apple board will not actually call a meeting, and the result of the article will not be any of the options that increase the pay of the current employees. I am the CEO of a small company that has a large percentage of front line employees. We live and die by the performance of our employees and work very hard to find, recruit, and retain extraordinary people. From time to time we get into this very same discussion. Invariably the discussion comes when our profits go up. At times we have had profit sharing plans that distribute some of our profits to front line employees. In my experience, those plans are not a good investment because employees decide to come work for us by evaluating our environment and the base pay. A dollar distributed in profit sharing does not earn the company a dollar in value, because potential employees logically discount the potential of profit sharing as it is uncertain. In lean years, it is common for owners of companies to pay more into the company than they extract in wages or dividends. This economic reality should not have any bearing on employee wages either. I have never heard of a company that has been successful recruiting great talent by telling them that during lean years they will have to pay to come to work. The marketplace sets wages for employees quite efficiently. David Segal and the New York Times knows that quite well. Taking a swing at Apple on the front page is great link bait though. There was a good article in the NY Times business section today about Google. Mostly about how Google is growing up. It reminded me of talk around Microsoft at the peak of its ride. At that time, the last thing Microsoft wanted to do was to become IBM. But they have. IBM has done an amazing job of reinventing itself as a consulting company, and Microsoft has taken over as the legacy systems company. Google meanwhile, is under increasing pressure from governments about its monopoly power, and use of customer information. All of the sudden, Google is spending just as much time and energy dealing with the government as Microsoft did with the Justice Department in its day. Actually, IBM had that same problem too. Also, today I started a new page where I am tracking the new tech bubble. Check it out here. Too much money looking for a home: The fundamental problem that caused the mortgage bubble still exists. The world is awash with cash because central banks have been trying to stimulate growth and there is no inflation in sight. The excess cash problem did not get solved with the mortgage crash. In fact it got worse because all of the money that came out of the mortgage market is still looking for a home, and it has been flowing into tech. At the same time, the cost to start up a tech company has dropped. So when Facebook goes public, the market will willingly value it at over $100 billion -- even though the CEO can operate without any board oversight. Not much "whole new world" talk yet: The end of each bubble cycle is marked by some desperate arguments that we are in a new world (this time because of the rise of mobile) and that the people that say gravity still exists just don't "get it". I bet these arguments will become central to the news coverage of the bubble this year. It always takes longer than we think: The smart people that knew the mortgage market was a bubble, knew it in 2004. The end did not come for four more years. This one will probably seem like it is inflating forever. It is true that smartphones are a revolution in tech. It is also true that it will accelerate the pace that new users can be brought into the market. But hey, it was also cool when the Americas were discovered or electricity was invented. Those bubbles burst and this one will too. The 800,000 physicians in the US comprise a large and intensely managed partner program for the drug companies. We are about to find out how intensely managed as the Affordable Health Care Act (AHCA aka Obamacare) now requires the drug companies to disclose how much they pay your doctor to prescribe drugs to you. It should not be a surprise that the drug companies pay doctors quite a bit, and those payments change doctor behavior. So it should be no surprise to find that some people may be diagnosed with ailments they don’t actually have -- so the doctor can prescribe the pills and get the money. Sales managers know that salespeople are “coin operated”. Better performance from salespeople is purchased with commission plans that compensate for more sales, more upsells, more referrals, more attached sales, more anything. Since our business is technology sales, and specifically channel partner programs, we think a lot about how to properly incent our client’s partners to sell more. We have seen this produce intended (improved sales) and unintended (systemic cheating) outcomes. Broadly speaking, generalized incentives are better than highly specific incentives when it comes to getting a constructive result. Sure if you have to move one product by the end of the quarter and you don’t care about the long term effects – a specific incentive will do the job. But if you want customers satisfied and loyal for the long term, working with partners to grow their business for the long term is better than quick hits. On The Media: Great overview segment from yesterday’s show. ProPublica: Building a database of the payments to doctors. Update one week later: Great article in the NY Times today about the 3 million children on Ritalin -- and how there is not evidence that it helps! David Brooks posted an interesting piece this week showing how we are in an unusual situation with both parties losing favor with the voters. We can see our nation getting more polarized every day, but this is the first time I have thought about how the polarization is hurting both sides. Here is an interesting poll showing one example of how the people fueling the fire are impacting their constituents: Fox News viewers less informed than people that consume no news at all. Add to this the way the the Occupiers are shining a bright light on inequality and the growing number of people that are giving up hope of earning a living, and we could be approaching a time where real change could happen. I am not talking about the kind of real change that is easy, measured, and pleasant. I am talking about the kind of change that Michael Lewis chronicles in his new book Boomerang. Here is the part about what is happening in Vallejo CA, and could happen to other parts of our country. Meanwhile those jokers in DC are arguing over who is to blame for the demise of the Supercommittee...brother. Well it has been a year and this is my 272nd post. I set out to write a blog entry every day and even though I came up a few short, I have enjoyed organizing my thoughts and working on my writing in 2010. Thinking about why I do what I do, or what I plan to do in the future is unavoidable (for me anyway) as the calendar changes to a new year. The blog posts I wrote this year were adequate notes to myself about what I was thinking at the time, and the fact that 4,000 other people found my posts interesting enough to read is flattering. So what to do in 2011? I have no plans to become a journalist, so I am not looking for a scoop or to break a story. I do think I could put more effort into some bigger writing pieces that further organize my thinking into actual arguments. So in the weeks ahead I am going to pick a few main themes and start to develop them into longer essays that argue a particular point. Tech Marketing (113 entries): I write a lot about this because my company helps large tech companies with sales and marketing. I think the changing role of the salesperson is worth spending time thinking about with Google and Facebook on one end of the spectrum because they really have no salespeople, and Salesforce.com on the other end spending 50% of revenue on salespeople. I don't know how this is going to work out but it sure will be interesting to watch. New Media (51 entries): My second most written about topic is new media. To me New Media is the decline of the newspaper, publishing, and TV we grew up with and the rise of blogging, micro blogging, social media, and streaming media over the Internet. We live in a very interesting time and the creative destruction of this sector is one of the things that makes it so interesting. Politics (47 entries): Next in line is politics - mostly in the US, but invariably overlapping with the rise of China as a world power. The big question of course is whether or not the US will stay on top and how many wars will we start as we struggle with our identity. Economics (44 entries): Finally economics. In the world I want to live in, those that create the most value get the most rewards. It does not take long to see that right now getting rewarded is often disconnected from value creation. Will my pollyannaish view of the world find its way into reality, or will Goldman Sachs continue to gobble up everything for themselves? There is one other subject that I find very interesting and that weaves throughout all of this: demographics. We often define people in groups and evaluate the relationships between the groups based on our understanding of the average within that group. This tendency prevents us from seeing the real picture. The growth rate of a nation's GDP or even the GDP per capita does not tell us very much. The unemployment rate in the US is around 10% -- but some sectors cannot find enough workers and others have 25% unemployment. If you are interested in this subject, read this from Foreign Affairs. Sure there are well over a billion people in China, but half of them are subsistence farmers who do not participate in the economy. I am looking forward to digging in on these topics during 2011. As always, your comments and thoughts are appreciated. Attention on Education: I have been involved in non profit initiatives to improve education in the US for 20 years and I have never seen the kind of focus and awareness on the education problem as we saw in 2010. There were always a few high profile people working on this -- now there are dozens. 2011 is the year we will start our climb back up. We have a long way to go, but not going down further is a great victory. Realism in the White House: We may not like the state of things, but just accurately assessing the problems is a big victory. In the past we had leaders that just made things up -- it is hard to address issues when no one wants to talk about them. International Humility: We have said it over and again enough times that the world community is starting to believe that we are not going to solve everyone's problems. We said we would get out of Iraq and we are actually starting to do that. There was a great line I heard the other day (not sure of the source): Saudi Arabia is willing to fight Iran to the last dead American. We don't seem likely to get sucked into that game. No Need for a New War: Yes Assange should have been on the cover of Time Magazine. I am glad he was not because that one event has jinxed many other people, and the WikiLeaks story is just getting started. Here is a great post on The New Republic about how WikiLeaks could end big business and big government. I don't know if that is true, but we do need a way to reduce the influence of big organizations before they drive us into a new war. Uncontrolled power always gets diffused somehow, and quite often it is a war that does it. Perpetually bad economic times also promotes war. We have very powerful big organizations and bad economic times -- a tough combo. WikiLeaks, or something like it, could be just the thing to pull the rug out from under the oil companies, bankers and the warmongers, and just in time too. In America we know that we have the most adaptable form of governance on the planet. I know that once we wake up and view our problems in the light of day -- we will prevail. I think 2010 could have been the year we accurately assessed things, and 2011 could be the year we start doing something about it. If you have some time this week and want to read some great background material, check out David Brook's Sydney awards for best essays of 2010. Every other newspaper story in 2010 seems to include a reference to how this next generation of Americans will have it worse than their parents for the first time in well, ever. I have been there among the alarmists trying to get people to worry more about the balance of trade, the state of our educational system, corruption in Washington, and others issues. Change does not come easily to humans and we all know that the bigger the problem, the more likely we are to change our behavior. This creates bad news inflation to inspire change. We hear it all day every day from just about every interest group. I have to wonder: Does it work? Do people really change their behavior from fear of bad things happening? There is some evidence that people do. There are many waterways in the US that have recovered from terrible pollution, we all recycle, and after suffering heart attacks - eating and exercise habits change. It could be said credibly then, that people's behaviors can evolve. Alternatively, people often do new things. Electricity, railroads, the Panama canal, the car, the plane, the space race, the computer, the Internet, and the cellular phone came to us as new things. New things that humans adopted vigorously. These were revolutionary new things. When talking with founders of start up companies or the people that finance them, the common belief is that new things get adopted if they are ten times better or ten times cheaper than the thing being displaced. The new thing gets adopted, the old thing dies, Schumpeter is proven right, and change happens. Revolution brings about much more change than evolution. Innovation Engine: Innovation happens because the innovators have confidence that they will preserve the value of what they create. Many companies are built round the patent and copyright systems, but many more have captured the value of their innovation without those constructs. Neither Google or Facebook are protected by patents or copyrights. This structural IP protection scheme will fuel an explosion of innovation -- limited only by the ability of people to think freely. Leap Frog: The idea that an emerging nation can leap frog the developed nations by rapid deployment of new technologies is a myth. A village with no telephone landlines and just cell phones has acquired communications capabilities much faster than anyone had dreamed, but can anyone really argue that they have leap frogged over and ahead of a town that has had landlines for 100 years and has cell phones too? This phenomenon will create markets for products from the developed nations. The first will be healthcare, the second will be education, and right after that -- anything that conveys status. Work Redefined: Soon we will be re-allocating all of the time we used to spend as computer operators to other productive activities. This could represent a dramatic change in productivity. Here is a post on the subject from November 30. I hope that 2011 is the year that the revolution takes hold. I hold out less hope for the evolution part. Either way it will be quite interesting to watch these things play out. it is funny how current experiences can randomly conspire to focus our attention on particular times of the past. The Wikileaks story reminds me of the Pentagon Papers, and I am also reading Keith Richards biography that reflects a lot on that same late '60s early '70s period. Through these were broader ongoing negative narratives like the Civil Rights movement, the Vietnam War and the 70s oil crisis. Sure things are bad now -- but I would argue that we are a long way from the worst time ever. The one thing that makes our current situation seem so dire is another year: 1989. The difference between all of those bad years listed and now is that back then we did not view ourselves as the undisputed sole superpower. Could it be that the fall of the Soviet Union and our ascendance to the top of the heap has put us at an altitude where the thought of a fall is more than we can bear? There is an article in Fortune magazine this month about short seller James Chanos and his big bet against China. I have written a fair amount about China, one of my first posts is still my favorite: Do We Want China to Fail? IP Theft. The work that the Chinese government is just now starting to do on piracy and IP theft will be the first thing abandoned if things turn for the worst. Aggressive Cyber Behavior: The Chinese government is already allowing or maybe even sponsoring efforts to compromise computer networks in the US. A stable and prosperous China will give us the chance to address this diplomatically. Nationalization: Fear of a Chinese economic collapse could drive nationalist factions inside China to take control of foreign investments in China with government support. Loss of a Market: While there is sufficient evidence that China wants the domestic consumer market to be served mostly by domestic companies, there will always be opportunities for US companies to benefit from a rising China. A declining China would remove the opportunity for either domestic or foreign technology companies. So we want China to continue to succeed in raising itself up in the world economy. We absolutely want to stay ahead by making ourselves more competitive. James Chanos has some good arguments about why China may be in trouble. Let's hope he is wrong this time. "In 2010, Chinese companies: 391 I.P.O.’s, worth $89.5 billion. American companies: 99 I.P.O.’s worth $15.69 billion." "America's creating two kinds of jobs: McJobs and MegaJobs--with nothing in the middle." "...you get a Ponziconomy. One where it's possible to "profit" without having done anything of enduring value." Needless to say he puts his weight on the side of America in Decline. I agree that our current course and speed point to a doomsday. However, I do not think we are done course correcting and am not inclined to count Americans out. We have been doing a good job of raising awareness and with any luck we will all agree soon that we need to do something drastic. It is going to be a long road back. In today's NY Times Paul Krugman says that the core rate of inflation is 0.6% -- the lowest number ever recorded. Those of us in technology realize that current inflation measures are inadequate because they do not measure Moore's law. We all know that the technology of tomorrow will be better and cost less -- and that is definitely deflation. Economists fear inflation, but they fear deflation more. Inflation can be addressed by raising interest rates. There is no known cure for deflation because by the time we get there, we will have flooded the market with cash and it clearly will not have worked. In addition, deflation incents people to do things that cause more deflation -- where inflation is self correcting. After all, if a buyer cannot afford the inflated price, less will be purchased, and if less is purchased, the price should come down. Falling prices is the same as falling inflation -- and there is the self correction. The two devastating effects of deflation are the increased relative cost of debt, and the underlying incentive to put off purchases until the prices go down more. Both of which reduce demand for products or services. Less demand is addressed with lower prices, and lower prices only make the trend accelerate in the wrong direction. Deflation breeds more deflation. Some years ago we had all of the computing power we needed. We used to buy upgraded machines because we needed more computing power. Features and functionality, often formed into the "killer app", drove sales. It has been a long time since a new version of office brought us productivity enhancing new features. Realizing that their customers had no compelling reason to buy, the makers of the technology started eating other industries. First was advertising. Google is a technology company, but all of its revenues come at the expense of the advertising industry. Google offers better advertising for 1/10th the cost. Replacing analog dollars with digital dimes is clearly deflationary. Next the technology industry is going to eat the labor market. With all of the computing capacity moving to centralized data centers, also known as "the cloud", companies are going to need much fewer technology people. It is already possible to run a 50 person business without any technology people on staff. Lowering the demand for workers is absolutely deflationary. After that the technology industry is going to eat the energy market. A very large percentage of the power used to run today's computers is wasted. Not only are the power supplies to PCs over sized by design -- and therefore consuming much more power than necessary, but many PCs just sit there using the electricity for no other reason that to create heat all night long. The centralization of computing will address this too. The result will be less need for electricity. Less need for electricity is deflationary. So I don't know if all of the QE going on will lead to out of control inflation anytime soon. I do know that the technology industry is going to be contributing to deflation for as far as I can see into the future. Boracay, an island in the Philippines with one of the most beautiful beaches in the world, is a place everyone who loves sun should see. The sand is spectacular, and the water is about 85 degrees F -- all year round. Like any beautiful place, it is hard to spend much time there before entertaining the thought of moving there -- even if it is just a conversation for fun over drinks. It only takes a few minutes to find out that due to the overnight popularization of the island there is essentially no such thing as free and clear title for property on Boracay. You can buy land there, you can build on it, but right as soon as you are done someone may show up and say -- "hey, that is my property"! By comparison, we have been very lucky in the US. More than just about any other nation, we have a veritable paradise of titles to property. When you buy a house, you are nearly 100% certain to have clear title, and you can actually find someone to insure that should there be any issue, they will cover you (title insurance). In most communities we have 150 or more years of title history -- further solidifying that the person who says they are the owner of the property is actually the owner. In order for property to sell, one must know that the seller can sell it. Any uncertainty and there will be no selling and no financing, and certainly no investing in improvements. It appears that the same people that brought us the mortgage crisis have a chance to bring end our confidence in free and clear title to property. Check out this piece in Business Insider. Bear in mind that the bankers would not have to cast a shadow on all titles in order to ruin the market. Even if a small percentage of titles are tainted, the title insurance would get very expensive or dry up all together. Without title insurance, there would be no mortgages. Without mortgages we would all be going back to buying homes for cash -- you know like Americans did before the civil war. So it is a good thing the foreclosure factories were stopped last week. Let's hope we can get out of this without erasing our confidence in our ability to own property.